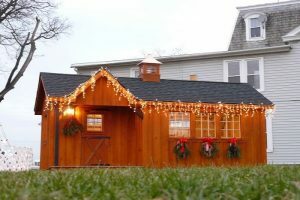 When looking to purchase a shed or an Amish built garage for your home, look no further than us here at All Amish Structures. After all, we are the leaders in the industry and have been providing local home owners with Amish sheds and garages for over 50 years. We are the leading providers of sheds and garages and have a solid reputation for building quality sheds and garages that you can count on to hold your vehicles and any other items that need to be stored. Here, out workmen are all highly skilled. When you hire us to build a garage or shed, you can rest assured that our staff will deliver you the product you deserve. In fact, our workmen even build these structures right on location here in Bridge Borough, NJ. This means that your garage is being built out of the best, highest quality materials. Now, you will have a large storage unit that will withstand whatever is coming its way. We promise you that. Whether you decide to buy a custom Amish shed or garage, you need to know that these structures are built to last. What is even better than that, though, is these units require little to no maintenance. This is what our customers love about our sheds and garages. These Amish built sheds and garages can hold everything from your lawn equipment, bikes, motorcycles, small boats, and even cars. Instead of using this unit as a store shed, you can always turn it into a workshop space. Your options are endless with our sheds and garages. Other than the functionality of our garages and sheds that we offer, here at All Amish Structures we are also known for how durable our outdoor units are. Any of these outdoor structures can be manufactured in a variety of materials. We also have a wide range of colors and styles to choose from, as well as other custom features. Another service that our Amish garage and shed builders provide our customers is home delivery. No matter if you live in High Bridge Borough or the surrounding areas, we will deliver the shed or garage to you. When you need quality Amish garages and sheds, turn right to us at All Amish Structures. We are a company that works hard for you so that you are left with a garage or shed that is exactly what you need.